I will admit, before my miscarriage, I had no idea what October 15th stood for. I had no idea because it didn’t affect me, it didn’t affect my friends or family members and no one had mentioned this day. How naive of me to think that. This day now means something to me and many people who I do know. 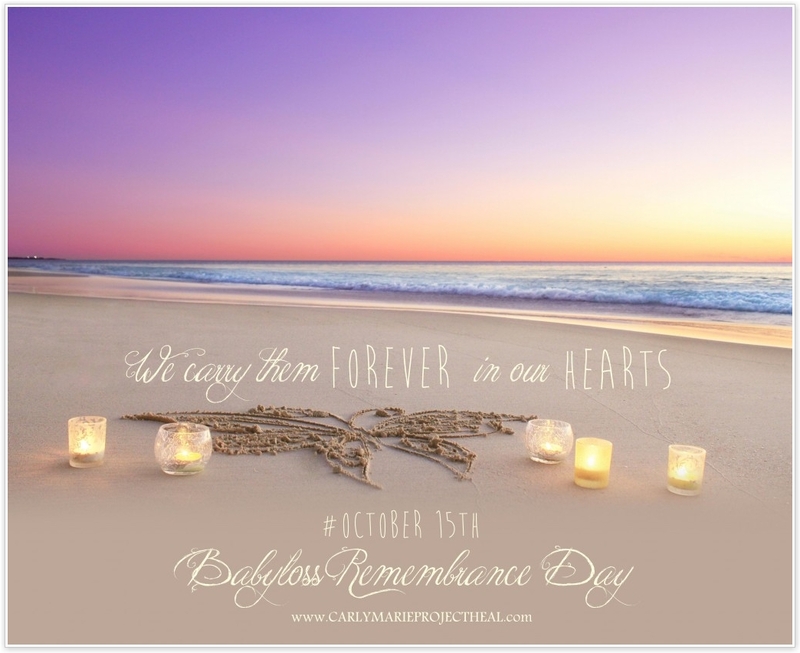 October 15th stands for Babyloss Remembrance Day. This is a time to spread awareness and recognize everyone who has lost a child to miscarriage, ectopic pregnancy, stillbirth, SIDS and other causes. Since my miscarriage people have come to me and shared their stories from when they lost their own child too soon. A story that they have kept buried deep, something that isn’t brought up amongst friends. A story that their own family may not know about. Imagine my shock when my own maid of honor stood in front of me and told me she had an 8 week miscarriage. Something she never even told her own mother until years after the fact. I can understand why people hold this secret close and don’t talk about it. My extended family doesn’t know about our loss. We hadn’t yet made phone calls to tell them I was pregnant, so I didn’t want to make the phone call to explain our loss. Part of me didn’t want to tell the same story over and over but there is a part of me that wishes they knew. I want them to know our butterfly baby existed, that she meant something to us, and that we hold this in our hearts. The other reason we don’t share our news, like it seems many others don’t, is the lack of understanding from others. We have had a lot of tough comments made to us regarding the situation. We have been made to feel that we were not grieving correctly, that we were making to “big of a deal” out of the situation, that we should have known the chances of this occurring, that this wasn’t a real loss or real baby. I don’t believe people made these comments to hurt us but people are misinformed about the subject. People want to be able to measure and quantify your loss, more so they can find a way to better understand it, there is no way to do this though. Sometimes people say the words to fill the silence, when just the silence is better. With a miscarriage people will say it is sad but they don’t understand everything else that comes with it. The stuff that isn’t in a pamphlet or isn’t cured with an ibuprofen. The nightmares, the sadness that will creep in out of no where, the inability to sleep, the hatefulness towards other pregnant women, the separation anxiety that you will have with your living child, husband or even dog. This is followed with a fear of getting pregnant again, the feeling of being robbed of any happiness for future pregnancies, the lack of faith in my own body and the challenge of a feeling like I am on a never-ending journey that I don’t want to define my life. I now live in a before baby and after baby life. I can tell you I bought those pudding cups when I was pregnant because they tasted great. I bought that wine before I realized I was pregnant. I ordered those decorations after my baby’s heart stopped but I didn’t know it yet. I knew the oil needed changed in the truck when I knew my baby was dead and it was changed after my surgery. This is how time in my life is currently being measured. It is my own way of dealing and separating. My own way of measuring my loss and what it has done to affect us. I am not the only one. We are not the only couple. There are 1 in 4 women out there that understand. People that have lived this, are living this, and have yet to live it but unfortunately will. This October 15th will mean something to me and my Husband. I will think of my own Butterfly baby and so many others that never took their first breath. I will think of all the Mom’s and Dad’s, who will never be able to hold the baby they were praying for, in their arms. The wombs that feel empty, the rooms void of what the future may hold, the faith that is broken, the tears that may fall without notice. I understand now. I feel your pain now. I hold my own secret now but I don’t want to bury it and I urge others not to bury it. We eventually find the way to move forward in our lives but that does not mean we forget the child we lost. They are apart of us, our story, our family and in our hearts forever. Thank you for this tender post, Sanibel. People are harsh. I don’t think I realized the amount of people that go through it either, even if I did see it in a Facebook feed or heard rumor of it. Way too many.